If I were to recommend a free mathematics tutorial website, I would definitely choose the Art of Problem Solving. 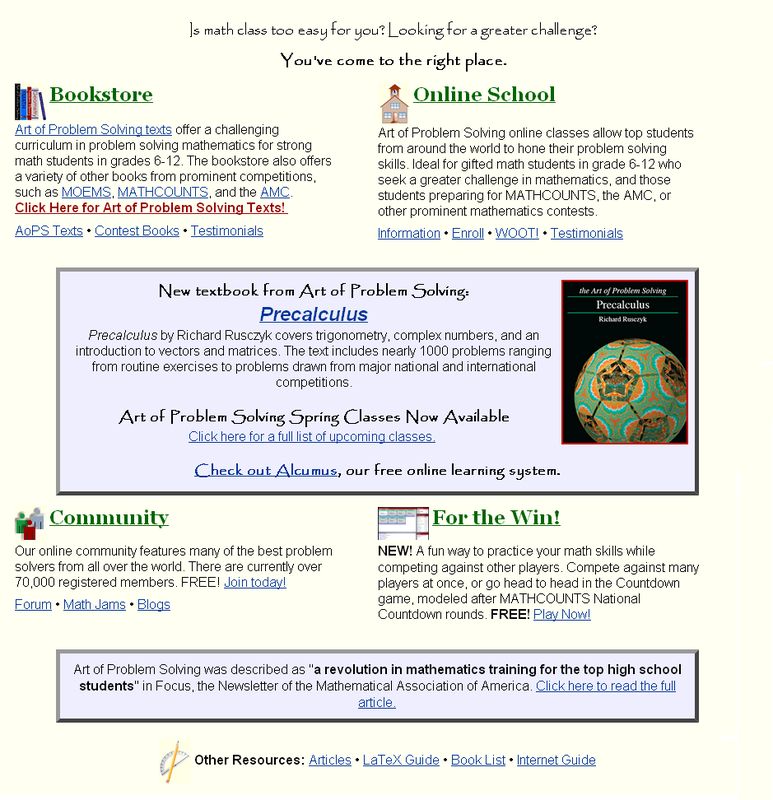 The Art of Problem Solving is a website where students, teachers, mathematicians and math enthusiasts meet online to discuss problems in mathematics. Shown below is the screenshot of their home page. The most popular feature of the the Art of Problem Solving website is Art of Problem Solving Forum. I had a firsthand experience with the Art of Problem Solving Forum when I was still studying. Sometimes, I had to seek help for topics that I did not understand or a problem that I could not solve, and the Art of Problem Solving had really helped me a lot. The reasons why I chose AOPS over other math help websites are listed below. Quick Response. When you ask questions in other websites, it would probably take a long time for them to respond. AOPS Forum, on the other hand, has more than 74,000 members as of this writing. Since there are many members around the world, there is a very good chance that your questions would be answered immediately. Wide Variety of Topics. AOPS problems ranges from elementary school mathematics to college mathematics. There are also sections for mathematics competitions such MathCounts, AMC and other well-known contests. College topics include calculus and real analysis, differential geometry, topology and linear algebra and many more. Latex Support. AOPS supports latex coding unlike other websites. Latex is used to embed mathematical expressions such as on websites, blogs and wikis. If you do not know about Latex, I have created a Latex tutorial here and here. Lots of Problems. AOPS has 1, 673, 927 topics (or problem posts) as of this writing. There are also problem solving marathons (click here to see example) where one post contains hundreds of problems. Own Wiki and Blogs. AOPS has its own wiki mostly contributed by users. Many users have also registered their blogs in AOPS. Online Math Classes. AOPS has free online classes called Math Jams where classes are conducted synchronously. Math Contests Problem Archives. AOPS has archived mathematics competitions around the world. Some of the famous contests such as the International Mathematics Olympiad. Art of Problem Solving also offers advanced mathematics online classes and they have published several books.